Today’s first aid kits have come a long way from their origins in 1888 when they were initially marketed for railroad workers. Workers laying cross-country track were frequently injured and, working in the middle of nowhere, they were very far away from medical help. In the 1800s, railroad work was especially dangerous. So dangerous in fact, that the railroads had surgeons onsite to treat severe injuries to workers building the railroads and working on the steam locomotives. While traveling by train, a conversation took place between a railroad chief-surgeon and Mr. Robert Wood Johnson of Johnson & Johnson. The surgeon explained that the railroad workers laying track were frequently injured and medical assistance was so far away it usually arrived too late to be of much help. In response, Johnson had the idea to package some of the products Johnson & Johnson made – sterile gauze, bandages, and dressings in boxes. Those boxes could be kept with the workers to treat and stabilize anyone injured until they could reach more comprehensive medical help. 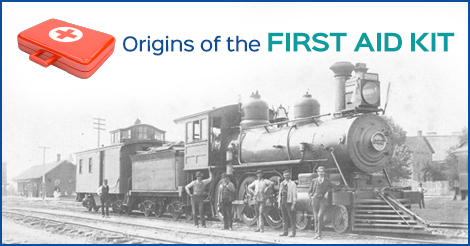 After conducting research, Johnson & Johnson put out the original commercial first aid kits in 1888 – one for the railroads and one general first aid kit. The general kit was meant for the public. When an injury occurred before the general first aid kit came into existence, the procedure was to have someone run as quickly as possible to fetch the nearest doctor – provided there was a doctor within fetching distance. Critical minutes and sometimes hours passed without treatment for the injured person. Often bystanders did more harm than good while trying to move or help the man, woman, or child who had been injured before the doctor arrived. Today, there are several variations of specialty first aid and medical kits. Whether you manufacture first aid, snake bite, or burn kits, Liquipak has over fifty years of packaging experience solving the challenges faced by the medical aid industry. Our low production costs help our customers meet or reduce operating expenses without sacrificing quality. To learn more about our experience and operation, please visit our website or call us today.